Show the users in Multiplayer on the front page like it does with profile chat. Could make MP a better place. Being able to see the Tier Points list of the other players. I'm 99% sure you could do this at one point in a really roundabout way. Dunno what happened. I forgot I made this video until someone brought it up saying that it helped them. I noticed that when you go to the standalone guide on the website, the thread was replaced by the wiki post, but the wiki post has way less flash player download links than the thread (only goes up to 12 instead of 16). Last edited by Rapta; 06-20-2017 at 04:32 PM.. Assuming that I did not want to make a notepad, write the FFR song name, and then my notes on that song, is there a way to write notes on FFR in-game (not meaning in the middle of a song)? If not, maybe there can be a symbol next to the spot where it says "AAA, SDG, Black Flag, etc". The note would ideally be seen by clicking the symbol or hovering your cursor over it. If there is another thread that asked this same question, feel free to redirect me to it. But he wants a way to add custom notes, probably for isolation or tricky pattern warnings etc., to which there is no feature like this. If you want to keep personal notes on different files, you will probably just need to keep a spreadsheet or something. It would be nice if you could get to a users profile from the leaderboards - when you click the names, it just resorts the leaderboard, which is what you were likely already looking at. Last edited by Rapta; 07-19-2017 at 05:15 PM.. If you click on the picture instead of the name, it actually lead to profiles. Last edited by Hakulyte; 07-19-2017 at 05:15 PM.. 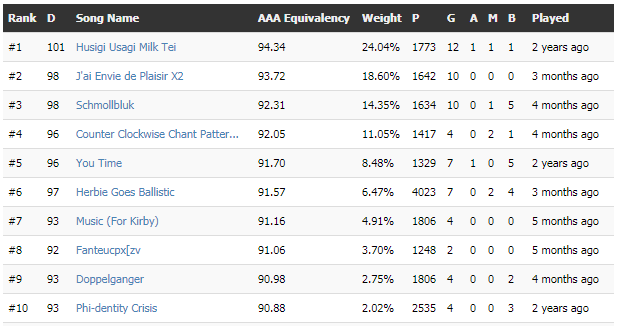 Using top 10 AAA equivalency by default would be nice for "Top 10 Level Stats". It could also be interesting to show PA with the "0-0-0-0" format instead of "score" which doesn't mean much without calculating it. 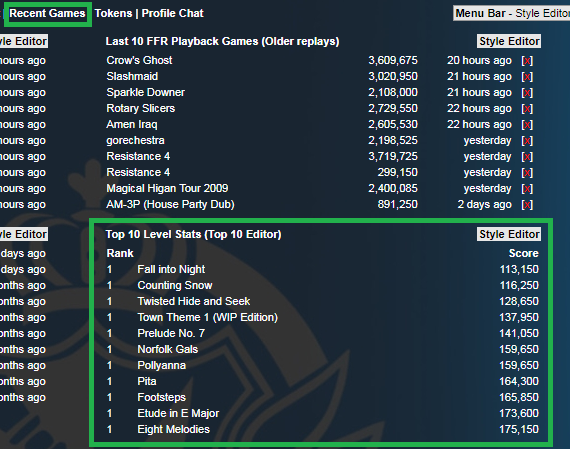 To be honest, at this point, I'm pretty sure the majority just click on "FFR Rank" and check leaderboard for stats. May want to also double check if updating ranks manually vs checking levelranks can create a conflict with achievements on front page. Last edited by Hakulyte; 10-4-2017 at 11:51 AM..
"Purchase all" option in the purchased songs store? - Track the BPM of every songs on FFR and show it publicly in the song leaderboard/song list. - Make the progress bar clickable in Song Previews and in Velocity Engine replays. Both are impossible, BPM is lost on conversion, and the progress bar would require updates to that engine which I can no longer do.